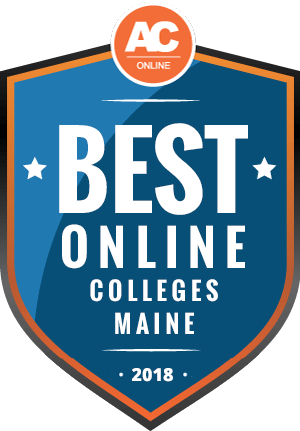 Why Choose Maine for Online Higher Education? According to the Maine State Legislature’s Office of Policy and Legal Analysis, the state’s economy shifted away from blue-collar jobs and toward positions that require some form of postsecondary education. Through 2024, the state expects to see a continued decline in employment for manufacturing, transportation, and other fields with limited educational requirements. To take advantage of new opportunities in this changing economy, you should consider attending an online college in Maine. This page provides an overview of these programs, including information on cost of attendance, admission requirements, and transferring credits. It also includes a ranking of the most affordable online schools in Maine. According to the Integrated Postsecondary Education Data System, 38 fully online programs serve just over 8,500 students in Maine. While students choose online education for many reasons, the flexibility and convenience of distance learning appeals to working professionals and single parents in particular. Other students may attend an online college in Maine to change career paths. These programs allow you to earn a degree in a growing industry without needing to leave your current job. Residents of Maine can receive significant tuition discounts when attending a public college or university in the state. For example, the University of Maine (UM) charges $293 per credit to state residents pursuing an undergraduate degree, while non-residents seeking their bachelor’s online must pay $366 per credit. Online students at UM must pay a $25 per-credit fee for online courses, however. To qualify for in-state tuition, you must prove legal residency in Maine for a period of no fewer than 12 months prior to your enrollment. Students living in other New England states may qualify for tuition discounts in Maine through the New England Board of Higher Education’s (NEBHE) Tuition Break Program. The cost of attending either a community college or four-year public institution in Maine closely compares to the national average, though students in Maine can pay a great deal less than those studying in more expensive New England states like Massachusetts or Connecticut. Out-of-state residents who take online courses in Maine typically pay less than students who choose to pursue a degree on campus. You can also save money by attending a public rather than private university or by earning an associate degree at a community college before transferring to a four-year institution. Attending an online college in Maine as an out-of-state student can help you save money on tuition, particularly if you choose a program that participates in NEBHE’s Tuition Break Program. Non-residents may also choose to study in Maine to specialize in a particular area. For example, the University of Maine boasts a highly ranked wildlife ecology program, a program that may not be available to you locally. Before enrolling in a program, make sure to confirm that your institution holds authorization to confer online degrees to students in your state. Maine participates in the New England Regional Student Program (RSP), a compact that allows students living in Connecticut, Maine, Massachusetts, New Hampshire, Rhode Island, and Vermont to receive tuition discounts when attending a program in another New England state. Roughly 900 undergraduate and graduate programs at more than 80 institutions participate in the RSP, also known as the Tuition Break Program. In the 2016-17 academic year alone, some 9,000 New England students saved over $60 million in tuition through the program. The average student saves about $8,000 annually. You can view a full list of participating programs on the NEBHE’s website. To more easily confer online degrees to students in other states, Maine joined the National Council for State Authorization Reciprocity Agreements (NC-SARA). All of the institutions in the public university system of Maine hold authorization through NC-SARA, as do many private schools like Saint Joseph’s College and Husson University. Forty-nine states participate in NC-SARA, meaning you can automatically earn an online degree in Maine if you live in one of these states. California does not participate in NC-SARA, though larger institutions may hold individual reciprocity agreements with the state. You should contact your school directly for more information. To compile our ranking of Maine’s top affordable online colleges, we looked at several factors related to cost, including tuition, financial aid opportunities, and discounts available to regional students. We also considered the quality of these institutions, reviewing data on graduation rates, student-teacher ratios, and the availability of student services. Finally, all schools on this ranking hold either regional or national accreditation. Keep reading to learn more about the best online schools in Maine. Below, you can find answers to some of the questions most commonly asked by students considering an online college in Maine. While much of this information applies generally across schools, you should check with your individual program if you have more specific questions. Do online credits cost more or less in Maine? If you do not live in Maine, earning your degree online typically costs less than studying on campus. For instance, at the University of Maine, non-residents seeking their bachelor’s at one of the university’s campuses pay $953 per credit. Non-residents enrolled in online undergraduate courses, by contrast, only pay $366 per credit. To compare across states, online students at the University of Massachusetts, Boston pay $390 per credit for their foundational undergraduate classes, though advanced coursework may cost up to $525 per credit. Private institutions in Maine often charge the same tuition for both on-campus and online programs. Husson University, for example, charges a flat rate of $480 per credit for students seeking a master’s in business administration, regardless of whether they study online or in-person. Online students can also save money by avoiding expenses like room and board, though most institutions do charge some kind of distance learning fee. Which Maine schools accept the most transfer credits? Through a comprehensive block transfer agreement, students at any of Maine’s community colleges can transfer up to 35 undergraduate credits in general education toward a bachelor’s degree at any of the seven institutions in the University of Maine system. Some private schools in Maine feature even more generous transfer policies. At Saint Joseph’s College, transfer students can apply up to 88 credits toward an undergraduate degree. Full-time students can usually earn the final 32 credits required for a bachelor’s in just one year. Husson University, another private institution, allows students with an associate degree from a Maine community college to receive up to 60 credits towards their bachelor’s degree. To transfer credits, you typically must submit transcripts from all of the institutions attended, including your high school. To get copies of these transcripts, contact your high school’s guidance department and your former college’s registrar’s office. Many schools require that you maintain at least a 2.0 GPA in your college-level courses in order to receive credit towards a degree. You may also need to pay a small fee. Will any online colleges in Maine accept a GED? Yes, nearly all online colleges in Maine accept GEDs in lieu of a high school diploma. However, you may find it difficult to earn admission into more selective schools with only a GED. Saint Joseph’s College, for example, expects students with a GED to earn an average score of at least 550, or the equivalent of a student who would have ranked within the top 25% of their high school class. If you only hold a GED, you should consider ways to strengthen other portions of your college application. You may, for instance, take either the SAT or ACT to further demonstrate that you possess the knowledge and skills necessary to succeed academically at the college level. You can request letters of recommendation from former teachers substantiating your study skills and commitment to your education. You can also use your personal essay as an opportunity to explain why you pursued a GED rather than a high school diploma. How many academic terms per year do online colleges in Maine offer? Most community colleges in Maine feature the same course schedule for both online and in-person students. As such, you can only enroll in a new class at the beginning of the fall term in September, the beginning of the spring term in January, or the beginning of the summer term in July. Nearly all public four-year institutions follow this same enrollment schedule as well. Attending a private online college may offer you some additional flexibility. Saint Joseph’s College, for example, features six terms throughout the year, each lasting eight weeks. While students can start their coursework at any of those six dates, they must still formally enroll in most programs in either January, May, or August. Which online colleges will accept FAFSA in Maine? The Free Application for Federal Student Aid (FAFSA) determines your eligibility for many forms of financial support by calculating your Expected Family Contribution (EFC). Depending on your EFC, you may qualify for federal grants, such as the Pell Grant for undergraduate students, or work-study opportunities, which provide part-time jobs to students on campus to help them defray the cost of their education. The FAFSA also helps determine whether you can receive low-interest student loans from the federal government, as well as grants and scholarships from your home state. To receive federal financial aid, you must attend a school with either regional or national accreditation. The accreditation process ensures that your institution meets certain academic standards and adequately prepares its students for careers after graduation. To confirm that your chosen program holds on of these two forms of accreditation, check the Council for Higher Education Accreditation’s online directory. Are there any free online classes I can take from Maine colleges? While many colleges and universities in Maine offer discounts and scholarships to help students with financial need enroll in their online courses, these institutions typically do not offer free online classes to the public at large. You may instead consider participating in a Massive Open Online Course (MOOC). These courses, offered by distance learning organizations like edX or Coursera, allow students to learn for free from instructors at schools like Harvard University, the Massachusetts Institute of Technology, and the University of Virginia. While you generally cannot receive college-level credit for a MOOC, these courses can help you learn about a new subject and or choose a major at a different institution. Some schools in Maine may allow students to participate in an online class for one or two weeks before requiring they pay tuition. Usually known as “course shopping,” this introductory period can help acquaint you with the online learning experience and your course’s curriculum before you make a final enrollment decision. Remember, however, that if you do not withdraw from a course before the shopping period ends, you must pay the course’s tuition in full. How can I find the online program options at Maine’s colleges? When researching online schools in Maine, start by looking at the distance programs offered by public universities in the state. These universities typically charge less in tuition than a private institution, and they also enter into reciprocity agreements that ensure you can legally and easily receive an online degree while living in another state. The University of Southern Maine offers answer to some of the questions most frequently asked by prospective online learners, such as whether you will receive the same degree as on-campus students, how you will interact with other students in an online class, and what sort of technology online coursework requires. These resources can help you develop a better grasp of what online education entails and determine whether this style of learning fits your educational needs. The University of Maine Online also features testimonials from current and former students, information on online degree programs, and available services for online learners. In addition to federal financial aid opportunities, you should also research state grants and private scholarships to help pay for your online degree in Maine. State and private scholarship programs often seek to support students preparing to enter a specific field, such as education or medicine. Others select their recipients on the basis of financial need or academic merit. Below, you can read about five scholarships available to students attending online universities in Maine. The Alfond Leaders Program provides student loan repayment assistance to individuals who live in Maine and work in a STEM field. While you do not need to attend school in Maine to qualify for this assistance, you must continue to live and work in the state in order to participate in the program. The State of Maine Grant Program offers up to $1,500 per year to students pursuing a bachelor’s degree in Maine. To qualify, you must be enrolled at least half-time at an accredited institution. In addition, your EFC cannot exceed $4,500. The program provides grant funding directly to your college or university. The children and spouses of public servants who died in the line of duty, including firefighters, law enforcement officials, and emergency services personnel, may qualify for a tuition waiver at a public university through this program. Children must be under 21 years old at the time of their parent’s death, though spouses of fallen servants can receive support at any age. Educators for Maine seeks to draw more talented individuals into the fields of teaching and child care. To qualify for this forgivable loan program, you must maintain a GPA of at least 3.0 during your high school or undergraduate studies. The program selects recipients on the basis of financial need, academic excellence, and commitment to their chosen profession. The Maine Medical Education Foundation offers forgivable student loans to deserving medical students. To receive an award, you must live in Maine, earn admission at a qualifying medical school, and hold membership in both the American Medical Association and the Maine Medical Association. You must also pursue a Doctor of Medicine or Doctor of Osteopathic Medicine degree.